What are the differences between version 2, 3 and 4? Version 3, introduced in early 2016, has a modern, fully responsive Web frontend, but was replaced by version 4 in 2018. Version 2 is not responsive and has an aging design. Both versions 2 and 4 share a common implementation of the communication protocols supported in SOGo and SOPE: LDAP, IMAP, SQL, CardDAV, CalDAV, and Microsoft Enterprise ActiveSync. In order to access the production builds, you need a proper support contract from Inverse. Use the following form to known which commands to execute to install SOGo using our packages repositories. No data leaves your browser so don't worry about entering your password. Besides its rich AJAX-based Web interface, multiple frontends are available for SOGo. Alternatively, you can use the ActiveSync support SOGo has. Apple iOS devices (v4.0 and later) are supported natively by SOGo for calendars, tasks (reminders) and contacts. BlackBerry 10 devices can use the CalDAV and CardDAV protocols, well supported by SOGo. Window Mobile devices can use the ActiveSync support SOGo has. Use the Outlook CalDav Synchronizer plugin for Outlook version 2019, 2016, 2013, 2010 and 2007. You might want to adjust these specifications to suit your testing environment and configure bridging of the network card. From the GUI client of VirtualBox, click on the File menu and select Import Appliance.... This will bring up the import wizard which allows you to select the .ova file included in the ZEG archive. Make sure you're using a bridged network adaptor and you have a DHCP server on your LAN. Also make sure that the bridged network adaptor uses the physical adaptor that has an IP address on your LAN. 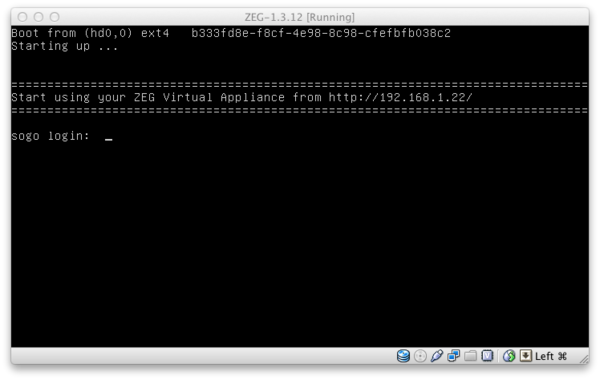 Once the appliance has finished booting, a URL will be shown. Please follow the next instructions from there.